Just finished up a run of SS Lochabers and had a few parts to put together this device. 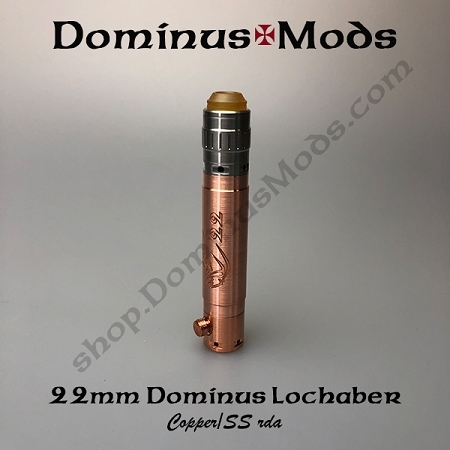 Copper 2016, 22mm side fire with a copper Hilt in the Classic Dominus slotted styling. Which happens to match the latest run of SS Lochabers and the Ultem big bore tip. 1 piece 18650 battery tube with the Dominus battery tube thread on both ends. All Copper internal conductive parts. Peek insulator material to perform up to 450 degrees. Precision fit moving parts for Hi-End performance. 1 piece SS deck and negative post. Copper 1 piece Positive post. Includes changeable 5/32" & 3/16" air jets.